Tried to "blur" the picture to show the holo. I had so many different polishes for this mani. On my pinkie and index finger the silver is two coats of Sally Hansen Xtreme wear in Celeb City and the glitter is Spoiled Shuffle the Deck. My ring finger and thumb is two coats of China Glaze With Love and the gradient is done with China Glaze Haunting (a pretty black base with micro fine silver and black glitter). The middle finger is Color Club Harp on it. Whew...that is a lot and haven't even gotten to the stamping! For the stamping I only stamped on three nails. I chose to leave the glitter nails alone. On the holo (Color Club Harp on it and the middle finger) nail I stamped using Konad plate 77 using Mash black then added a red glequin to the middle of the design. 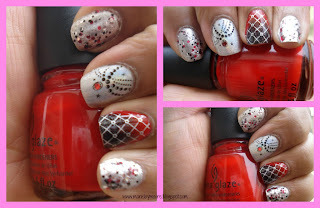 Finally on the red and black gradient nail I stamped an image from BM 310 with Sally Hansen Silver Sweep. I topped off the entire mani with Seche Vite! Let me know what you think of this?? I am still trying to get the hang of the skittlettes mani. I struggle with it because I am unsure of what is too much. I feel like its busy and doesn't look good. I am not even sure if this mani qualifies as a skittlettes mani...hmmm. Do you have tips on what I can think or do when selecting colors and designs for my skittlettes mani's?? Thanks for stopping by!! Off to play with my little man...Happy Sunday!